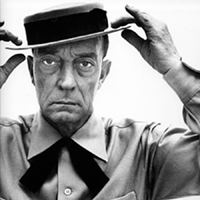 In New York, in the summer of 1964, Buster Keaton appeared in a short experimental film written by Samuel Beckett. In this play, set in an Italian restaurant in Greenwich Village that summer, two gentlemen named Sam and Buster attempt to communicate with each other with the unlikely help of a chattery young waitress with theatrical ambitions, who mistakes Buster for Moe from The Three Stooges and Sam for his agent. A funny and moving play about the quiet, absurd heroism of two apparently very different but very great artists. This three-hander features Buster Keaton and Samuel Beckett enjoying a meal while discussing an upcoming project. Throughout the night their Waitress tries again and again to figure out who her customers are. The play was well acted. The comedic timing was undeniable from both the Waitress and Buster Keaton. They both got some solid chuckles out of a 11pm crowd. While the straight man (Samuel Beckett) was quite reserved, the actor did a good job playing his part with some thoughtful and committed lines. The three had great connections with each other and they were completely in the zone the whole show. This created some beautiful moments, especially between the Waitress and Buster Keaton at the end. There was very little movement in the piece which made the quiet moments feel a little too long. There were also quite a few long stretches of silence peppered throughout that made the play drag. I also found it was rather uncomfortable watching the young waitress be hit on by the much older Keaton. Interesting concept that fell a little flat. If you have the time and money its a decent filler show.